Microsoft says HoloLens will start rolling out to developers within the “Windows 10 time frame,” but no one really knows what that means. Over the weekend, Microsoft CEO Satya Nadella clarified this just a tad in an interview with the BBC. In short, it looks like you’ll be waiting a while to mine your couch cushions for coal, diamonds, and redstone. In other words, Microsoft is more interested in creating augmented reality working environments for offices and hospitals before moving on to Minecraft and Halo. That’s not to say that gaming isn’t an important part of HoloLens. Almost every mention and demo we’ve seen from the company included gaming. 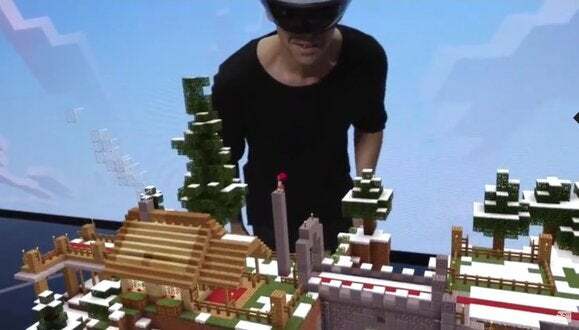 HoloLens was front and center at E3 with gaming demos, and earlier this year Nadella pretty much told The New York Times that he bought Minecraft with HoloLens in mind. The story behind the story: The physical limitations of HoloLens may be why Microsoft is foucsing on developers and business before turning to entertainment. While HoloLens offers some decidedly cool gaming demos, a complaint from critics who’ve tried the device say the field of view leaves a lot to be desired. When we last saw it, HoloLens was like looking at a smartphone set a few inches in front of your eyes, which is decidedly smaller than what you get with virtual reality gaming headsets like the Oculus Rift. HoloLens will still be cool for some games, but that limited field of view matters far less when you’re looking at a document compared to a digital war zone.